Wallpaper is back in a big way with new releases knocking us out at every turn. Never has there been a better time for sourcing wallpaper specifically for children’s rooms – from modern to vintage, there are designs galore when not so long ago wallpaper was the stuff of the dark ages! 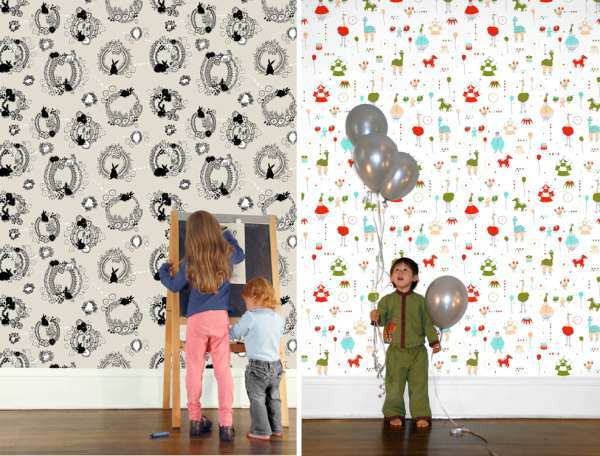 We’ve fallen in love with the new range of childrens’ wallpaper designed by Emily Marie Cox for Hygge & West. Three designs – Circus Troupe, Rabbit-Tat-Tat and Busy Town – mix vintage prints with contemporary hues to strike a captivating balance between old and new. I would choose the monochrome rabbits for me and mine, whereas Mandi loves the cheery circus print. Hygge & West offer a variety of ways to buy the wallpaper, which means you can use it for different kinds of projects. For a cost-effective DIY artwork, it’s sold by the yard. Single and double rolls are also available for the full room treatment. You can order a US$5 sample with shipping included – this cost is refunded once you buy a roll. The children’s collection is US$165 a roll, or $30 a yard from Hygge & West. Also worth checking out are the Julia Rothman and Ferm Living collections, some of which I would love to see in a child’s room (or my own! ).